Geoffrey Davis, pioneer of the modern eucalyptus oil industry in Australia passed away peacefully on 1st April 2019 aged 96. Geoffrey Davis was the founder of the essential oil company G.R Davis Pty Ltd and Mt Mulga Pastoral Co and the pioneer of the modern eucalyptus industry in Australia. Geoff founded G.R Davis in 1964 and today the Company is a leading Australian eucalyptus and tea tree oil producer, exporting to over 40 countries throughout the world. While Geoff studied at University his potential was identified by Horace Victor Marr, who owned and managed Plaimar, the large Perth based Australian essential oil company founded 1919. For over 50 years Plaimar was the force in Australian in essential oils and natural products. HV Marr, father-in-law to Geoff’s brother Linton, took an immediate interest in Geoff appointing him Managing Director of Plaimar Sydney. Following the death of HV Marr, the Sydney office of Plaimar was gradually wound up and Geoff saw this as the opportunity to establish GR Davis with his wife Sybil. Geoff and Sybil originally managed GR Davis out of the family home on Sydney’s North Shore, securing suppliers, establishing a customer base and blending oils. Looking at ways to increase oil supply and efficiency, Geoff conceived and created a mobile distilling vessel technique. This was the world’s first completely mechanised operation for harvesting and distilling eucalyptus oil which is now in use by distillers throughout Australia and the world. Identifying the need to consistently deliver premium Australian eucalyptus oil to an ever growing customer base Geoff and now his son Richard, further developed the property in West Wyalong which now covers 18,000 acres. A tree breeding program has resulted in over 4 million eucalyptus and tea trees established in the plantation and a large water conservation project with a series of interconnecting dams provides year-round water for the irrigation of seedlings. Over the course of his career, Geoff developed a reputation as a leader in his field. Geoff was contracted by the United Nations where he researched the possibility of developing a eucalyptus oil industry in Kenya. Industry bodies called on his expertise including the Australian Standards Association where he was a founding member, and the Essential Oils Producers of Australia where he was also a founding and then Honorary Member. With a background in science, Geoff developed partnerships with leading academics at the Australian National University and CSRIO to establish tree breeding programs with the aim of identifying genetically superior plants that would ultimately increase oil production on the plantations. Many of these partnerships continue today. Fifty-five years on, Geoff’s company G.R Davis has grown into a major producer of eucalyptus oil and tea tree oil and has a long history with loyal customers, some whom have been with the business since its inception in 1964. 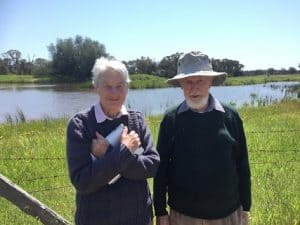 Geoff and Sybil Davis at the West Wyalong G.R Davis property.